The Return of the Di Sione Wife “I’ll have the earrings now. Or are there more hoops to jump through?” Dario Di Sione should be feeling triumphant, he’s about to fulfil his grandfather’s wish and retrieve the precious earrings, but all he feels is fury. The beautiful lawyer handling the sale is the woman who betrayed him six years ago… his wife! But discovering Anais has kept their child a secret, makes Dario determined to be the father he never had. But Anais’s return to his side casts a new light on past events, and now it’s not the child he just wants to claim! 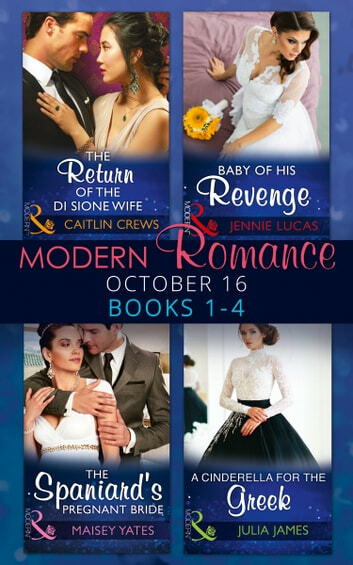 Baby of His Revenge by Jennie Lucas “I can make you explode with pleasure…” Kassius Black rose from the ashes of his catastrophic childhood driven by revenge against the father who abandoned him. With near complete ownership of his father’s assets, Kassius’s last vengeful step is to present him with an heir he’ll never get to know! “And if I’m wrong I will pay you ten million dollars.” Pure in body and mind, Laney Henry is the perfect candidate to wear Kassius’s ring and carry his child. So Kassius delivers his ultimatum confident he has nothing to lose… or does he? The Spaniard’s Pregnant Bride by Maisey Yates “You’ll be mine. You’ll be my wife.” With her identity concealed, Allegra Valenti enters Italy’s most glorious masquerade ball determined to make happy memories to sustain her through her impending, cold arranged betrothal. But a passionate encounter with a masked stranger has consequences that tear apart her dutiful life. Brooding Spanish Duke Cristian Acosta cannot believe the masked siren he let his guard down for was his best-friend’s sister – the pampered heiress he grew up despising. To safeguard the Acosta legacy, Cristian must adorn Allegra with a trinket of his own – a gold wedding band! A Cinderella for the Greek by Julia James Fairy-tale for just one night? Cruelly mistreated by her step family, Ellen Mountford retreated to the shadows of her father’s home, feeling unworthy and unloved. But when powerful tycoon Max Vasilikos wants to buy the glorious English country estate, Ellen can hide no longer… Under the scrutiny of the Greek’s arrogant stare, Ellen fights the urge to retreat further and stands up to him, yet Max is relentless. He tempts her out to a glamorous charity gala, where Ellen is transformed from dowdy recluse, to belle of the ball. Now there is a new glint in Max’s eye that is even more devastating …seduction!